Come See Our Work in Person By Visiting One of Our Commercial Projects. A gray concrete bar top for Paloma Grill in Stamford, CT.
Character-grade walnut wide plank bar top we recently installed for the restoration of Childs Restaurant at the Ford Amphitheater on the Coney Island Boardwalk. Custom Premium Wide Plank walnut bar top done for the restoration of Childs Restaurant on the Coney Island Boardwalk. This concrete bar top was made for the bakery display at the Granola Bar in Westport, CT.
A closer look at the concrete bar top at The Granola Bar in Westport, CT. This unique bar top is made of a single slab of engineered concrete that measures over 10' long without a seam. 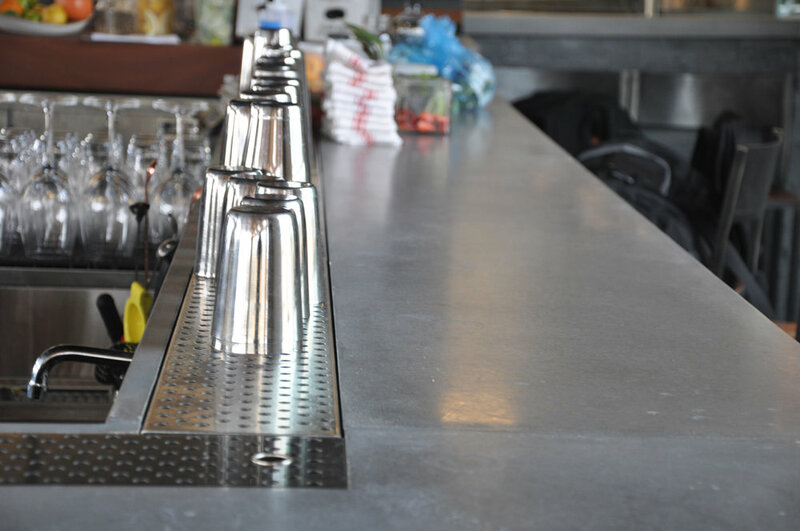 A close look at the honed finish of a concrete bar top that's installed at Paloma Grill in Stamford, CT.
A neutral engineered concrete bar top at Locali Pizza Bar in New Canaan, CT. Aged zinc bar top installed at Winston Bar in Mt. Kisco, NY. A curved zinc bar top that we fabricated for Winston Bar in Mt. Kisco, NY. An L-shaped patina finished zinc bar top at the Gordon Bar within the chic Sixty Soho Hotel in Manhattan. A patina finished zinc bar top adds to the chic aesthetic of Soho Sixty Hotel's Gordon Bar in Manhattan. A classic cherry bar top with a matching bar rail at the Ardsley Country Club in Westchester, NY. This commercial wide plank walnut bar top was made for a corporate office's break area in Manhattan. A commercial-grade cold cast zinc bar top made for Counter Reformation, the new wine bar at California's Parker Palm Springs Resort. U-shaped bar top with a sheet metal zinc top and a cold cast zinc "H" edge detail. A great photo of our commercial cold cast zinc bar top that we made for Parker Palm Springs in California as featured in Desert Magazine. The bar top measures over ten feet long and has a U-shaped front and a cold cast zinc "H" edge profile. A custom L-shaped bar top that measures 30' x 8' x 2' is the centerpiece of Calexico NYC's location on the Upper East Side. The bar top is constructed of edge grain maple measuring 2 1/2" thick and made to fit around the posts anchoring the bar. An edge grain maple wood bar top at Calexico NYC on the Upper East Side of Manhattan. The natural maple bar top is about 30' long with an extra 8' on the return side of the L-shape. Concrete bar top for the cafe area at Katonah Yoga Studio in Bedford Hills, NY. The cool gray concrete bar top and countertop match the open and airy feel of the cafe and inviting nature of the studio. Waterfall style custom concrete bar top for a cafe at Katonah Yoga in Bedford Hills, NY. Commercial Bar Tops can be fabricated from any of our normal countertop materials. Wood bar tops are a classic choice among traditional restaurants and pubs, whereas concrete and zinc bar tops are more popular amongst more modern establishments. All of the materials used for commercial bar tops are low maintenance. Wood bar tops come with our signature Marine Finish, a permanent and waterproof finish that just requires some Lemon Pledge for daily cleaning. 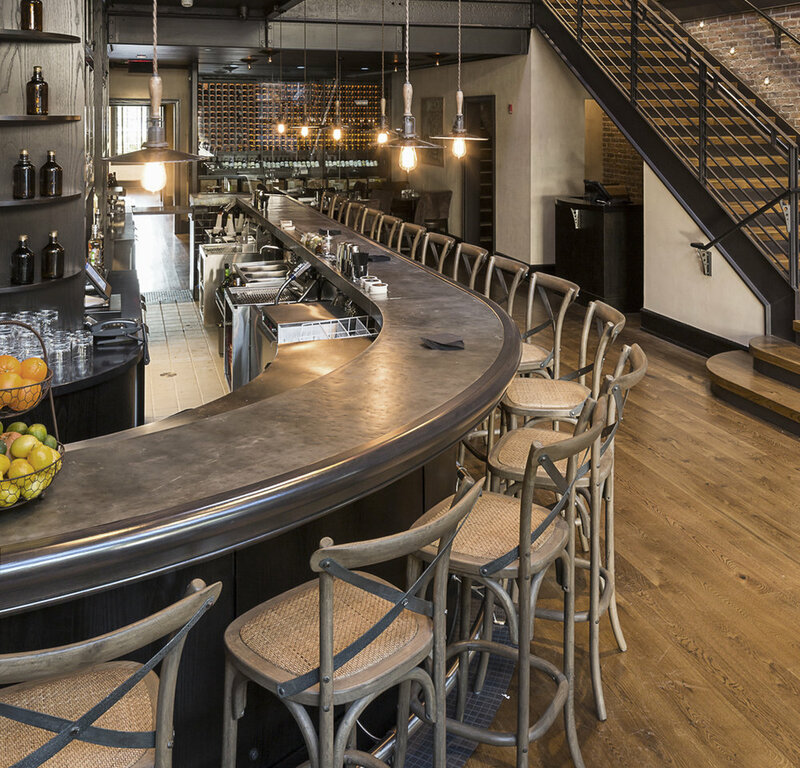 Concrete and Metal bar tops will evolve throughout the lifetime of the bar top. Both will for a pattern of use over time, and the reactive metals (zinc, copper, pewter, bronze) will form a darker patina over time. All you need for daily cleaning is Windex. For more in depth maintenance, we recommend oiling the concrete with the Concrete Dressing Oil we provide, and using a metal polish, like Noxon, as needed for the metal bar tops. All of our commercial bar tops are manufactured in and delivered from our factory workshop in Mt. Kisco, NY. As a wholesale manufacturer, we offer you direct access to our entire design and engineering team to ensure your design vision will come to life!